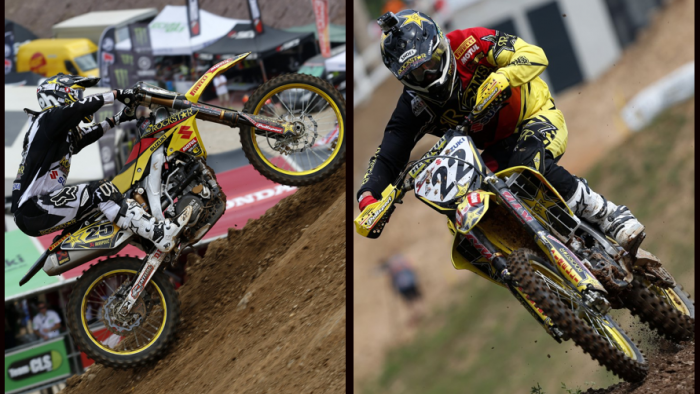 After winning the opening moto, cruel luck struck Rockstar Energy Suzuki World MX1's Clement Desalle when the Belgian was four laps away from a sure-fire podium-finish in front of 38,000 spectators today at a hot Maggiora for the Grand Prix of Italy. Desalle had comfortably aced the opening race for his second chequered flag of the year, but an electrical problem forced his first retirement since 2010 and saw a seventh trophy of the season slip away. Maggiora was a 'roll back of the years' for the FIM Motocross World Championship that visited the iconic and redeveloped venue for the first time this century for the ninth round of 17 in the series. The hillsides were packed with fans expectant of more stellar action in the competitive MX1 class and the hard-pack track was rolling, rutted and slippery. After a difficult Saturday qualification heat, Desalle started superbly in the first moto of 35 minutes and two-lap duration and began chasing World Champion Antonio Cairoli. When the Italian crashed '#25' inherited the lead and then eased his way to a seven-second victory. With a full 25 points in the bag Desalle was then foiled with a mid-pack start for the second moto and needed at least a quarter of the distance to work his way into fourth. As sometimes happens in a technical sport, Desalle was robbed of a deserving spray of champagne in what was his first mechanical upset since the Brazilian GP at the end of 2010. Team-mate Kevin Strijbos enjoyed a top-five start in the first moto but his lack of feeling around Maggiora plagued him at crucial moments and he could do no better than seventh place. A flattened track in the second race saw the Belgian gain more confidence and stature; and although he was seventh once more, crossed the finish with a better sensation about his performance. Desalle is third in the MX1 world championship points table and 83 behind Cairoli and 32 adrift of Maggiora-winner Gautier Paulin. Strijbos is still fifth and just in front of Tommy Searle. Rockstar Energy Suzuki World MX1 now finally enjoys a free weekend after one month and travel across three continents. Three consecutive Grands Prix in Sweden, Latvia and Finland then follow into the month of July. "Everything was good in the first moto; the start, running second and then taking over after Cairoli's crash. I had a good rhythm and set good lap-times and just controlled the gap until the end. I didn't take any risks and I felt really positive for the second moto. The start was so important here and unfortunately I was out of the top five. I fought hard to get back to fourth and suddenly the bike stopped. It was so unlucky and it just feels like we are always fighting something. We have a free weekend now and I don't think I will ride and just do some good training next week." "In the first moto I had a good start and thought 'OK, let's try and go with them' but I just didn't have the speed or any answer for them. I couldn't see where they were winning time. I was pretty bad out there. In the second moto things got better and the lines came to me. It suddenly became more fun and the jumps were easier. Two top 10s mean that it has not been a good day but I have to take it. I'll think about the second moto though and I really want to thank the team because they changed so much and worked so hard to try and find a solution. Even though it is the same bike I have ridden all year, I was just searching for something to help me feel more comfortable and clear my mind. Too bad I didn't get the results today. It is good to finally have a week off now; after GPs and the American trip we have been pretty busy."